Viddora is the logical choice for the final Everest slot after her win in the Group One Moir Stakes. Viddora has put her hand up for the final slot in The Everest with victory in the Group One Moir Stakes at Moonee Valley. The Lloyd Kennewell-trained mare held off Everest slot holder Brave Smash in Friday’s night’s dash over 1000m to score by a length-and-a-quarter with Sydney visitor Spright third. Kennewell said he had fielded queries from Everest slot holders Max Whitby and Neil Werrett during the week. “Hopefully that’s what they wanted to see,” Kennewell said. “I was told she was in their top four and I think that secures it on what I saw then, if it doesn’t, what do you do to secure a slot in The Everest. Favourite Nature Strip finished eighth of the 11 runners and trainer Darren Weir hinted he may not take his place in The Everest. “We’ll focus on the horse and let him tell us,” Weir said. Kennewell and long-time stable jockey Joe Bowditch made the move to set up base at Caulfield at the start of the season after a successful careers in Adelaide. The pair combined with Viddora in Perth’s Winterbottom Stakes at the end of last year and Kennewell said Friday night’s win was his biggest thrill in racing. “To reach the pinnacle after just moving here, it’s brilliant,” Kennewell said. “It was like watching the Winterbottom all over again. We got to the corner and I felt we had the race in our keeping. “I’m so proud of Joe. He moved his life over here as well. Bowditch gave a fist pump as he crossed the line and said the victory made up for missing by a “pimple” in last year’s race. He said he felt he had the race won a long way from home. 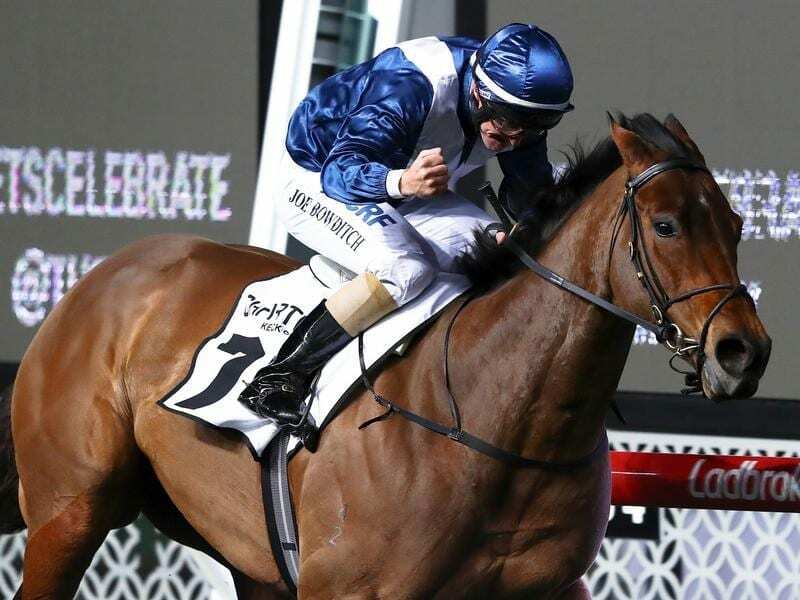 “When I hooked her out I thought I’ve just got to run down Nature Strip and to be honest I thought we ran him down too early,” Bowditch said. “She stargazed the last little bit but she was too good in the end. To make the win a little sweeter, Bowditch’s wife Jen owns five per cent of the mare who has won just shy of $2.4 million from her nine victories.